Read More, 6080 feet. Sixty nautical miles are in a degree. Read More. 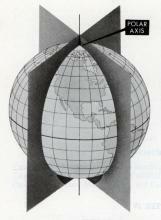 Like the slices of an orange, longitude lines converge at the poles. Navigators use time to measure speed and to determine longitude. As there are 360° in a circle, and the earth rotates once every 24 hours, the earth turns 15° every hour and 1° every four minutes. Read More on most nautical charts. An instrument receiving its directive force from a gyroscope operated by electric motors. Its directive action is based on the mechanical laws governing the dynamics of rotating bodies. Satellite-based navigation system developed and operated by the United States Department of Defense becoming operational in 1993. It uses 24 satellites, and users can determine position, speed and time. 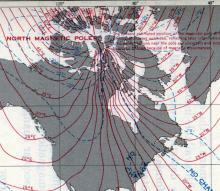 system can also show directions as true north. 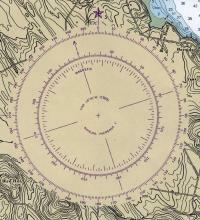 Magnetic compasses are used to back up gyro compasses and are still the main type used on smaller boats. Term used in celestial navigation to indicate the angular distance of a celestial body north or south of the celestial equator, which is a projection of the earth's equator. 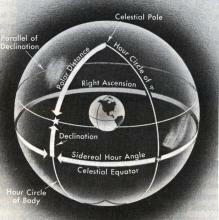 Right ascension is the celestial or astronomical equivalent of longitude. It is expressed in hours and takes its reference base from the First Point of Aries, the point where the Sun crosses the Equator in the spring, measured east.. 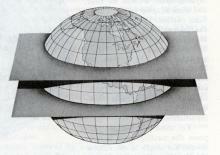 The celestial poles are directly over the earth’s poles, and the celestial equator runs over the earth’s equator. Great circle on the celestial sphere apparently traced out by the sun in the course of a year. It is so called because for an eclipse of the sun or moon to occur, the moon must lie on or near the ecliptic. Read More is the line the sun follows through the year, ranging from 23 1/2° North declination to 23 1/2° South declination, in keeping with the angle of the earth’s axis to the plane of the solar system. The amount of time that the real or apparent sun is ahead or behind the mean (clock time) sun.